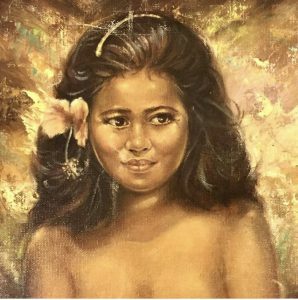 “Hawaiian Teenager.” Oil painting by A. Sidoni. One of The Michael Aaron Gallagher Collection’s most celebrated artists is Anthony Sidoni, whose vibrantly colored paintings demonstrate a masterful artistic technique. Anthony Sidoni (1919-2012), who signed his paintings “A. Sidoni” was born in Buffalo, New York and eventually moved to West Hollywood, California. An award-winning artist, who was twice voted “Artist of the Year,” his exceptional talent for painting portraits and other contemporary scenes garnered the attention of celebrities and art enthusiasts who admired his work. Notable collectors of his paintings include Cary Grant, Jerry Lewis and Sammy Davis Jr. The first Sidoni painting Michael added to his collection was called “Young Girl,” and it was originally sold by Robert Sills Gallery in North Hollywood. Although it was slightly damaged when Michael discovered it years later, he was amazed by the vivid blend of earthtones in the abstract background and how artfully it portrayed the island girl. “Young Girl.” Oil painting by Anthony Sidoni. 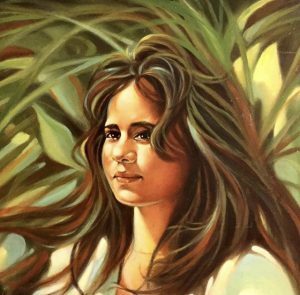 As if it was a portrait of the same girl painted years later, the second Sidoni piece Michael acquired was titled “Hawaiian Teenager.” Painted in 2009, it is one of Sidoni’s most beautiful portraits, not only showcasing his skill for portraiture, but like the other works in his Hawaiian series it also celebrates the green backdrop of the tropical paradise that serves as its setting. The shadows cast by the sun, the subject’s wind-swept hair and its overall tone make it a stunning example of his talent. With a deep appreciation for Anthony Sidoni’s work, Michael hopes to one day add more Sidoni paintings to his collection and to continue to learn more about the extraordinary artist behind them.